HarModulator combines twin chromatic pitch shifters with modulation to deliver an extremely wide range of effects from the subtle to the insane. Chromatic pitch shifters allow you to set the pitch ratio of each of the voices in semi-tone intervals (12 steps per octave). 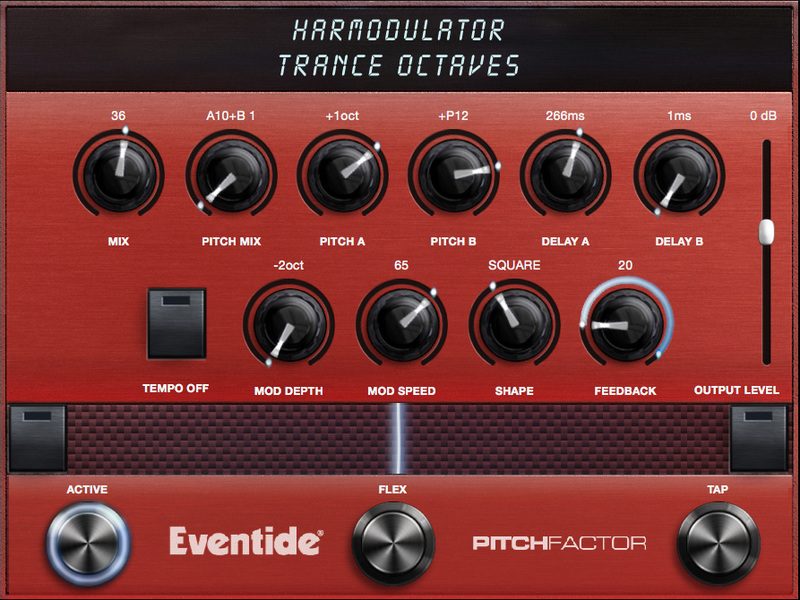 HarModulator features a six octave range (three up, three down). To get a sense of how to use the modulation function, it’s best to start simply by setting both Pitch A and Pitch B to UNISON, the delays to minimum, and feedback to 0. Now use the Depth control to set the amount of pitch modulation and the Speed control to adjust the modulation rate. Turn selecting different modulation shapes and sources. Note that you can select ENVELOPE as a source and use the dynamics of your playing to drive the modulation. OK, now try that with some pitch shifting, delay and feedback! wet/dry mixer, 100% is all wet signal. Controls the ratio of the level of Pitch A to Pitch B.
Selects the pitch shift interval in semitone increments from down three octaves to up three octaves. Controls the amount of time delay of the A pitch shifted output. With Tempo OFF, delay is displayed in mSec. With Tempo ON, delay can be sync’d to the tempo and is displayed as a rhythmic sub-division of the tempo beat value. Controls the amount of time delay of the B pitch shifted output. With Tempo OFF, delay is displayed in mSec. With Tempo ON, delay can be sync’d to the tempo and is displayed as a rhythmic sub-division of the tempo beat value. Controls the amount (or depth) of pitch modulation displayed in cents over a four octave range (two octaves down, two octaves up). Fine control for micro-pitch modulation is available and displayed in cents, ranging from -30 to +30 cents. When the modulation is a positive value the two voices will modulate in sync with each other; when the value is negative they will modulate out of sync. Controls the modulation rate. Note: If Envelop is selected as the Mod Shape [SHAPE], then modulation is driven by the amplitude of the audio input and Modulation Rate [M-RATE] becomes a Sensitivity [SENS] control. Selects the modulation shape. Select Envelop and your playing will drive the pitch modulation. Controls the amount of feedback for Delays A and B. Shifts both voices up one octave..